It’s 1:30 and I text Kirstin to make sure everything is okay. She thought we were meeting tomorrow, I thought we were meeting today. And baby, we are burning daylight. But before I know it, she pops through the door with the most cheerful grin and an enormous spread of cheese, charcuterie, and accoutrements explodes all over the kitchen (and I do mean explodes). In this small food biz world, we chefs have to stick together. Kirstin Jackson is a dear friend and very talented cheese monger. She’s the author of It’s Not You, it’s Brie: Unwrapping America’s Unique Culture of Cheese, has presented twice at the annual American Cheese Society, judged cheese at the Good Food Awards, teaches private classes (like stretching mozzarella!) for big companies like Google and Facebook, and has written for NPR, LA Times and the SF Chronicle. We’ve been cooking up a special three-part series for you. Today, Kirstin is answering your most burning cheese questions. Next week, we’re going to teach you how to make an easy cheese at home, and finally, we’re going to…..well, actually, we’re going to keep that part a surprise. But trust me—it’s going to be gouda. At what temp should you serve cheese? Like a good glass of red wine, cheese should always be at room temp. If you serve cheese straight from the fridge you’re missing out on so much goodness! The cheese needs time to relax, open up, and show you what it’s made of. Unless your cheese is something so oozy that it will take over an entire plate (like burrata—just take that out for 20 minutes before serving), remove your cheese from the fridge 45 to 60 minutes before your guests arrive. Your cheese needs a little time to get ready, too. If you’re not eating your triple creme with a spoon, here is a guide: As a general rule, if a cheese like brie or a triple-creme is a circle, cut it like a pie starting from the inside out. If cutting a triangular wedge like Manchego, rest the wedge on a plate and cut it into slim triangles using the original shape as a guide. If you have a thicker slice like Comté or Gruyere, cut the cheese in half horizontally and then vertically into matchsticks so there is rind on the end of every piece. 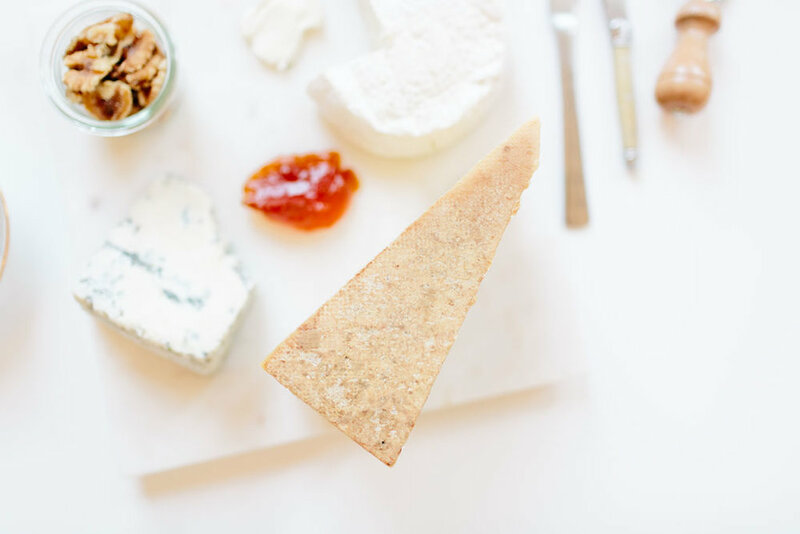 If you have an aged, crumbly cheese like cheddar or gouda, chisel it into chunks—it will only resist being sliced into thin slices anyway! Rennet – what is it? Rennet is an enzyme that helps proteins and butterfat in milk bind together to form a curd—what you need to make cheese. Originally from the stomach lining of a calf, lamb, or kid, rennet replicates in cheesemaking what the enzyme did in the animal’s stomach to digest its mother’s milk. Weird? Yes. And a surprise to many vegetarians. Nowadays rennet is either traditional (animal, like in Gruyere or Parmigiano-Reggiano), vegetarian and microbial, a DNA replica of the original, or, made from plants or flowers like thistle petals! Cheesemakers choose different rennets depending on the flavor and textures they produce, to whether they’re vegetarian. What should I consider when I buy cheese—where is the best deal? The key with cheese is always to make friends with your local cheesemonger. First, find a cheese shop or a grocery store whose cheese section you like. Second, tell the person behind the counter what cheeses you love. Third, ask them for help buying budget-friendly cheeses based on your preferences. Don’t be embarrassed—mongers love finding a deal as much as you do. Fourth, take their advice! Mongers are friendly, super into cheese, and want you to leave (and come back) happy. The other option is going to a farmer’s market where you can talk to the cheesemaker directly and often find some sweet deals. In my book, no. What’s more important than having a certified organic label on the cheese is knowing that the animals and the land they’re raised on are well cared for. Who will know this? Your cheesemonger (see, they’re pretty cool, right?)! If you’re concerned with sustainability, talk to the people behind the counter, or the cheesemakers at the market. They have all the goods. I’ve heard cheese has a “season”. Is this true? Yes! Not only is spring and summer when you spot baby goats bounding across Sonoma fields, it is also when their mamas are eating the freshest grass and wildflowers around. And we can actually taste that. Because milk is an expression of what animals are eating and cheese just intensifies the flavors, sometimes you can even taste when a goat has been snacking on rosemary, or blackberry bushes. The trick to tasting the seasons is to work backwards. Cheeses like chevre or fromage blanc that are only a few weeks old will taste like the pastures the animals were on just weeks ago, and a six month-old Alpine cheese sold in December will be made from July’s milk. One cheesemaker told me she created the cheese as a whole and the rind was an intentional part of the whole. Another told me he just used the rind to pick up the cheese when he flipped it in the cheese cave. So the answer is, there is no rule. Older PostTop 5 Recipes of 2018!